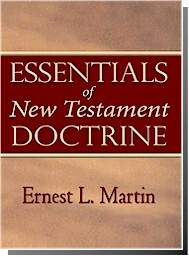 You can order Essentials of New Testament Doctrine here: Order Book. This book is designed to be read in order so that vital information can be progressively understood. Reading this book in its proper order will greatly enhance your understanding of the full message of your Bible and your place in God's plan. Chapter 11: What Is Grace? Chapter 13: Just What Are Human Beings? Chapter 15: Can Sinning Angels Be Saved? Chapter 25: How Were We Chosen? Chapter 30: Just What Is God? Chapter 33: Just Who Are You?